I was beginning to get cabin fever, combined with mid-term tunnel syndrome, which is when you’re halfway through the semester and can’t tell if your students are learning anything. The idea is that you’re swimming down a tunnel and have come too far to go back but still can’t see the other end yet, plus you’re holding your breath. Sometimes called mid-semester blues. So I suggested that we go to some nearby city and see if things look different when we leave this giant megalopolis. District 7 was starting to seem like a small waterlogged strip mall lost in a fog of gasoline exhaust. As you can see, my attitude was starting to slip, which was affecting other things. But Joe is still coughing (ever since early August) and when we take a walk at night and go to a restaurant his cough gets worse. Now I see why there are no other pedestrians!!! And why people wear masks. Going for a walk along a big street with clouds of exhaust billowing at you is not the same as going for an evening stroll. Joe said OK, so I mentioned it to Vinh, who said maybe Nghia would take us to his home town, Phan Thiet, which is 4-5 hours on the train or bus and is a “small city” with a beach. She said he might agree because it would be a way for him to get home for a night and he could translate and make sure we wouldn’t get lost. Vinh called Nghia and Nghia said yes, so he’s gone to buy our tickets. We’ll buy his, too. We’ll leave tomorrow, Saturday. In the meantime, this afternoon, Friday afternoon, when we came to the office following the Class of 2015 graduation ceremony, Vinh said that a woman named Michelle Gonzalez was coming. She’s an evaluator, a freelancer currently working for the Department of Labor, looking to see if there are any long-term impacts left over from a USAID/DOL program that took place 3 years ago. Her card says, “Evaluation consultant, International Labor, Education and Health.” Her current project in Vietnam is motivated in part by the expectation that the Trans Pacific Trade Partnership will increase the pressure on Vietnam to adapt to international labor standards, sign onto the ILO conventions on freedom of association, 85 and 98, and actually begin to have real collective bargaining. So has there been any progress toward that end, specifically as a result of that USAID/DOL program? We had a chance to visit with her for 15 minutes before the meeting started.She went to Berkeley, worked with their LOHP program, and we knew a lot of people in common. Then were invited to join Vinh and Dean Hoa in the meeting, which took place downstairs in a very nice, fancy conference room. This turned out to be very interesting. Apparently the project in Vietnam was awarded to a group called DFI in Washington DC. It was supposed to update labor studies programs in Vietnam. “Labor studies” was her term; the TDTU program is called “labor relations”. I don’t know if the distinction is clear to either party (labor studies is academic; labor relations is applied). Phase 1 was funded by USAID. Then Phase 2 was picked up by the US Department of Labor. The focus was on training MOLISA labor inspectors, who are usually the people who do mediation. However, they don’t have training as mediators, and they are already busy doing wage and labor inspections. This is fine with employers who feel that the whole requirement to engage in social dialog on a quarterly basis is a burden, so they would rather just pay the fine, since it is not large. The project was a two year project, but MOLISA did not approve it until the first year was gone. These projects require you to spend all your money during the project, so that meant that two years’ worth of money had to be spent in one year, cutting short the time available to do the project right. One activity of the project was to work with labor studies programs. Her assignment now is to evaluate that project several years later, to see if there was any lasting impact. Dean Hoa said that the first phase, the USAID phase, did help them do some work. They invited Kent Wong from UCLA to come over, and someone from Harvard. They shared this with two universities in the north where there are labor relations programs like the one at TDTU. They also wrote a textbook in Vietnamese, about social dialog, collective bargaining and mediation, which was shared by all three university programs. As far as the second phase went, Dean Hoa said that it enabled them to invite experts to share labor relations knowledge with students. This included Richard Fincher, Katie Quan, Jan Sunoo and another person whose name I had not heard. He added that even though the experts only shared knowledge and experience from the US, they still benefited because they learned skills and process. Gonzalez asked what Dean Hoa would like to see happen. He would like to send their students to the US to get their MAs and have a cooperation agreement with a US university. He would like TDTU students and lecturers to be invited to participate in ILO research projects in Vietnam and the ILO could hire TDTU students as interns. 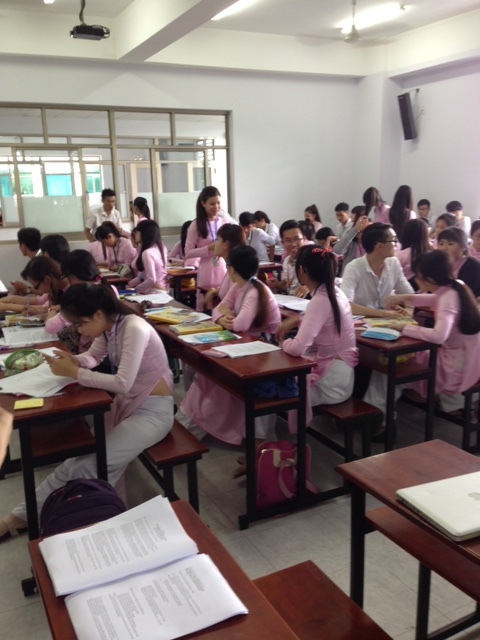 I spoke up about a basic, immediate need: the need for translators: translators for classes, for materials, for library books, for curriculum, pointing out that right now, all translation goes through Vinh who is overworked. Gonzalez remarked several times on how different the US and Vietnamese models are. I am less and less convinced of that, the more I learn. Once you get away from what happens at the table, they are not much different. What matters the most is the quality of the support for the union among workers and the preparation that the union has done prior to getting to the table. This is what we’ll emphasize with our students.